Radiator leaks are nothing new, and some technicians may initially blame a faulty part, poor construction or shoddy workmanship during installation when a leaker shows up in their bay, particularly when it’s a later model vehicle that has failed. But sometimes the radiator may be the victim of rapid coolant temperature changes caused by a faulty or rapidly degrading thermostat that is opening and closing too often. When this happens, hot, then cold, then hot, then cold, then hot, then cold (you get the idea) coolant is sent from the engine block to the radiator, effectively shocking it back and forth from hot to cold and then back again, over and over. 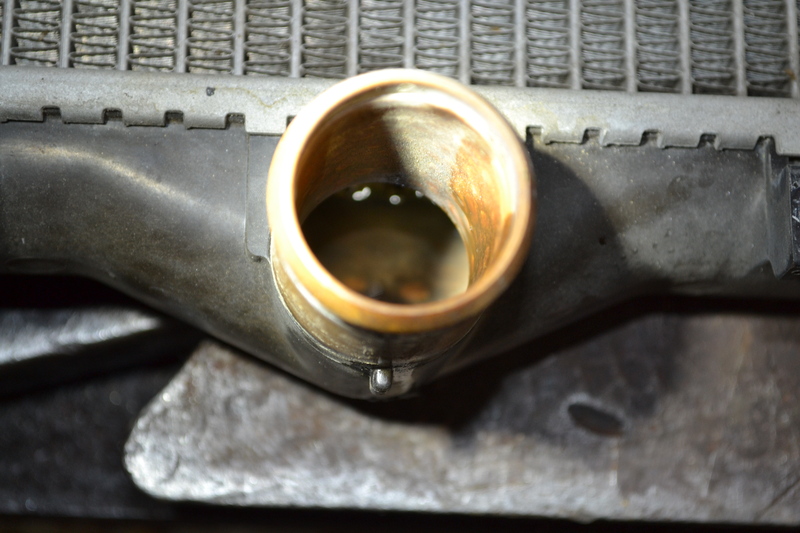 This rapid change is called thermocycling, and it causes radiator tubes to quickly expand and contract so much that they disconnect from the radiator’s side tanks, allowing coolant to leak out. It’s a failure similar to those found in the solder joints of copper pipes or on electronic circuit boards. GM has identified similar issues in vehicles including certain 2014-2015 Chevrolet Silverado, Suburban, and Tahoe models, as well as the GMC Sierra, Yukon and Denali, and the Cadillac Escalade with 4.3, 5.3, or 6.2L engine. In a series of Technical Service Bulletins, which include #PI1513B titled, “Coolant Smell and/or Slight Leak at Radiator,” issued on November 30, 2016, GM presents comments made by customers, such as smelling coolant while driving or when outside the truck. These complaints may or may not include a coolant leak under the front of the vehicle. GM recommends that technicians begin their diagnostics by inspecting the radiator for any signs of leaks, such as those that may exist where the flat radiator tubes meet the side header tanks. Particular attention should be paid to the four corners of the radiator, areas which may experience the most fluctuations. The cause could be related to excessive thermocycling of the cooling system, brought on by excessive cycling of the thermostat. Technicians’ initial conclusions are often an incorrectly constructed radiator , or a weak tube to header joint, which allows coolant to leak. In some cases, the technician may successfully replace the leaky radiator only to have the replacement fail after a period of time, ultimately causing the owner to bring the car back to the shop, The technician could assume the replacement radiator is also defective and exchange it once more. But the actual root cause of the fault may be the thermostat, which if it cycles open and closed too often, can shock the radiator by sending out cool and hot coolant. Ideally the temperature of the cooling system should remain constant, or change slowly over time without rapid, frequent or excessively wide changes in temperature. The final fix includes not only a thorough inspection and replacement of the radiator to solve the leak problem, but also changing out the thermostat, and of course, GM has an updated part number to address the overcycling. This entry was posted in MACS Member, Mobile Air Conditioning, Training, Uncategorized and tagged #MACSW, #radiator leaks, mobile air conditioning, professional service, summer travel, vehicle. Bookmark the permalink.